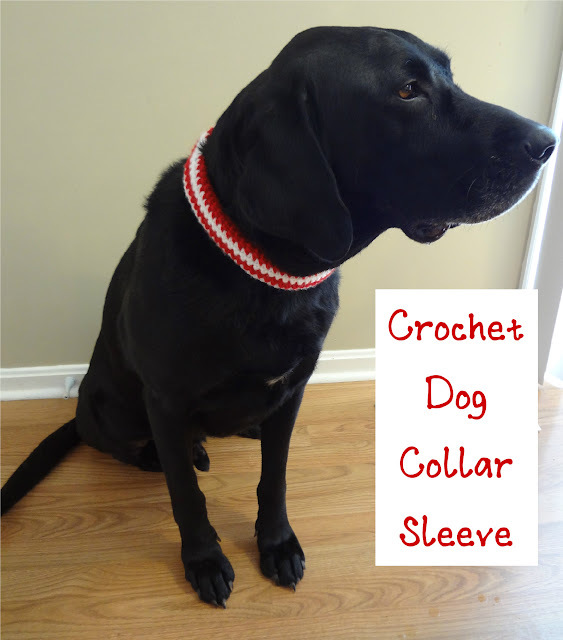 Fiber Flux: Free Crochet Pattern...Crochet Pet Collar Sleeve! Free Crochet Pattern...Crochet Pet Collar Sleeve! If you're dog or cat is not into wearing clothes, here is a fun alternative...a crocheted pet collar sleeve! 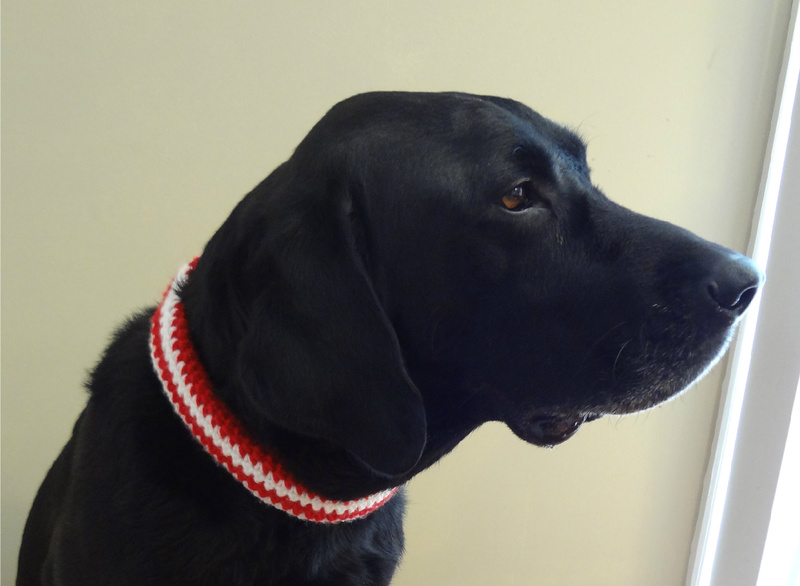 Simply slip it over their collar and your furry friend will look festive in no time! Sized for your own pet's collar, it can also be made in any color for any occasion. It is important to note that the sleeve does not join to make a ring...this allows the collar clasp and tags to still be visible for safety purposes. Kind of like a pet "scarf" that wraps around their neck! Small amounts of yarn in colors and weight of your choice (note: it is advisable to use a machine washable hard-working yarn, as dogs like to roll around, etc...nothing too delicate!) This is a great project for yarn leftovers! *Note: This sleeve is crocheted lengthwise, folded in half and seamed. I used two rows of each color for the candy stripe effect. Start by making a chain the length of the collar, plus two. Sc in the second ch from the hook and make a sc in each ch across row. Ch 1, turn and work a sc in each space until you reach the end of the row. Repeat this row until collar is desired width. I checked it with the collar as I went to get the best width and fit. I made it have a slightly wider fit so the collar would easily slip into it. Weave in ends and seam it up lengthwise up the side (but not the openings on either side). Slip your pet's collar in and you're all done! You can also give the sleeve a twist after it's on for a candy cane effect too if you wish.